We’ve seen all this before, almost exactly the same. Back in the middle of 2011, European officials remained fully confident even though things were already working backward. The ECB had in May 2010 “bailed out” markets as well as PIIGS, or so the media claimed. All that was left was time. On their side was Brent oil. Jean-Claude Trichet, Europe’s top central banker at the time, was more worried about the inflationary consequences of crude than he was the grand deflationary aspects of European banking. Despite his embarrassing “rate hike” in the middle of 2008, Trichet let the ECB do it again in April 2011. By June of that year, he wanted everyone to know, he made it his business for everyone to know, that the risks to Europe’s economy were all on the upside. Booming even. In those circumstances, the central bank must prevent increases in the prices of raw materials from being incorporated into the long-term inflation expectations which could trigger second round effects on wages and prices. Oil first, wages second, consumer prices thereafter. 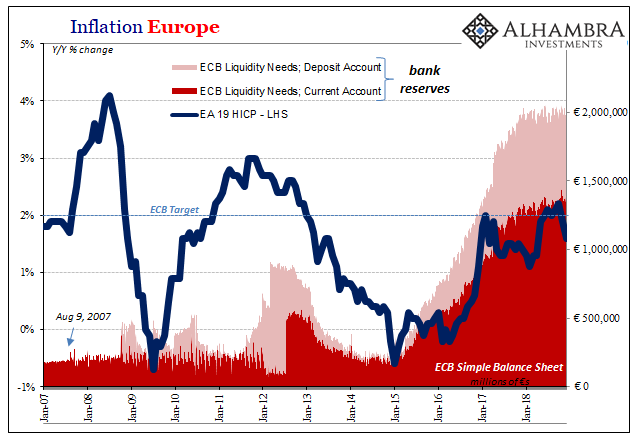 The following month, July 2011, two completely unrelated things happened almost simultaneously: the ECB kept to its super positive view and struck another “rate hike”, while at nearly the same moment the global monetary system plunged into renewed disorder. In many ways, all that count, it has never been the same. One way in which we know this is the core European inflation rate. Stripping out Brent (as well as food, alcohol, and tobacco), the HICP index sunk following the eurodollar breakdown in 2011 and has never come back. There was a minor, very small uptick in the earlier months of 2017 during Reflation #3 but it wasn’t meaningful (though that didn’t stop the hyping). 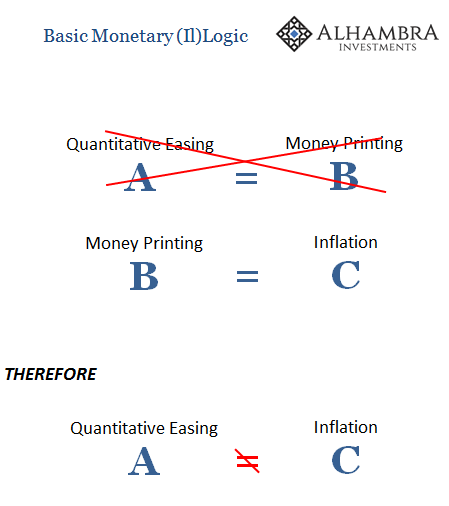 The ECB like the Federal Reserve is trapped on Step 1. Just as in 2011, there’s the tantalizing Brent boost keeping the headline consumer price index growing just about where the central bank(s) wants it. But, despite almost two years of “booming” growth, that’s all there is to it. No Step 2 wages. The core rate in Europe, like its cousin in the US, hasn’t budged despite considerable presumed assistance (and constant rhetorical reassurance) from officials. The numbers on Europe’s moneyless monetary programs are absolutely astounding.  At the end of 2018, and the formally declared termination to QE, the ECB holds €2.1 trillion in sovereign assets, €262.7 billion covered bonds, and €178.4 billion corporates. Those three programs alone account for the more than €2.5 trillion scale to the LSAP’s. 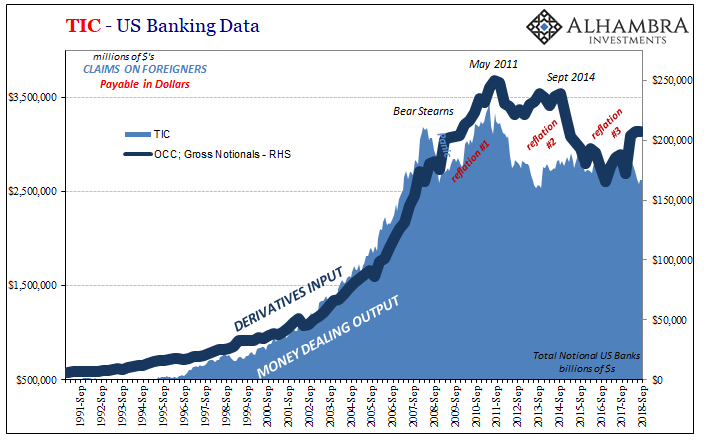 On the other side, the central bank has allowed better than €1.9 trillion of additional (theoretical, not practical) liquidity: €1.3 trillion of bank reserves in the current account earning nothing for the banking system plus a bit over €600 billion in the deposit account “yielding” minus 40 bps. Hundreds and hundreds of billions, several trillion altogether, and recent consumer price inflation like 2011 is all Brent. It’s as if QE’s and LTRO’s just don’t matter in the real economy. Now with oil prices crashing again, unexpectedly, of course, there isn’t even that. Hundreds and hundreds of billions, several trillion altogether, and the HICP index rose only 1.6% year-over-year (flash estimate) in December 2018. That’s down from 1.9% in November following just five months at or above the central bank’s 2% target. The direction for Europe’s HICP totally inconsistent with the hysteria, with that wrongway direction increasingly assured the further oil reverses. Two and a half trillion for five months predicated on crude oil alone? Oil accomplished what no central bank appears able to, having now quite rudely taken it back. This matters for a whole lot more than Europe’s inflationary condition. You are fooling yourself if you don’t think, just like in 2011, markets haven’t noticed just how ineffectual monetary policies have been. Mario Draghi, Trichet’s successor, was given some benefit of doubt in 2017 because it seemed like things were at least going in the right direction – starting with Brent. But if Brent didn’t become wages and wages becoming consumer prices outside of energy, then none of it worked. Inflation was, and remains, the monetary check that the economy is responding as is expected and forecast. If Europe’s inflation, like US or Japanese inflation, is the product of just the one commodity then it’s not. They intentionally try to make it sound complicated but it’s really that simple, absolutely Euclidean. If trillions don’t leave a positive mark on the economy, what state might exist if the economy then encounters further downside difficulties? The market action of the last few months of 2018 across the world are an answer to that question. Everything changed in 2011. Reflation #3 never really had a chance. The oil price rebound was a fool’s paradise. 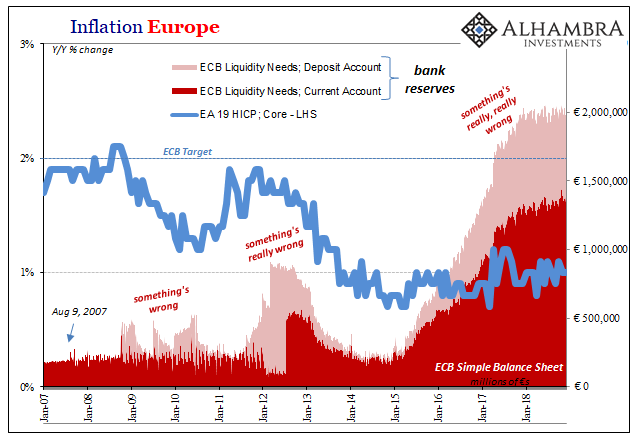 The only thing Draghi seems to have learned is avoid becoming too impatient getting himself in a rush to expose his gross monetary illiteracy, jumping the gun (twice) based only on crude like Trichet did not that long ago. Then again, 2019’s just begun and denial is the only thing never in short supply at a central bank.